By Virtue of the Proclamation of the Superior Administrative Council under the presidency of Governor General Jose De La Gandana, Lila became a municipality on January 20, 1868. 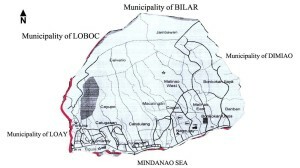 It is a 5th class municipality situated in the southern part of Bohol, facing the Mindanao Sea. It is bounded on the East by the municipality of Dimiao, west by the municipality of Loay and on the north by the municipality of Loay and on the North by the municipality of Loboc. It has a total land area of 3,393.33 hectares and a population of 11,990 living in 2,177 households. It has 18 barangays, 10 are coastal and 8 are upland. Lila is an agriculture based municipality. The narrow plain along coastal area is Lila’s version of Rice Terraces. Water supply is abundant in the Municipality of which studies has been made to make it a possible tourist attraction. Commercial activities are done in the public market. Lila aims to be a prosperous, peaceful, self-reliant, law abiding rural community conscious and vigilant in preserving its ecology with a thriving regulated mining and agriculture based industries.